Laura Bradley has been teaching middle school English in Sonoma County, California since 1988. She also developed and teaches a design lab class, and co-created and continues to teach a broadcast media class, where her students produce the school’s daily news show. Laura holds an M.A. in Educational Technology, and is a Google Certified Innovator, Google Certified Educator, PBS Digital Innovator All-Star, National Board Certified Teacher, Bay Area Writing Project Teacher Consultant, and first place winner of the Henry Ford Teacher Innovator Award. 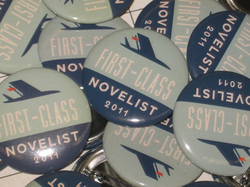 Her students' enthusiastic response to NaNoWriMo in 2011 inspired Laura to share the experience with other teachers so that more teens could join the ranks of novelists. Contact Laura here if you'd like more information. "#ThinkPossible: Challenging Students to be Novelists"
"An EduAwesome Project for Your BestYearEver"
"The Birth of Student Novelists"
"A Day in the Life: 5 Tips for the NaNoWriMo Agenda"
"10 Tips for Assessment: NaNoWriMo and Beyond"
"Turning Reluctant Writers into Novelists"